I had absolutely no intention of making this dress. Then I had all the #monetaparty tags flooding my Instagram and I couldn’t resist it any longer! I spent ages trawling through my jersey fabric stash to find something I could use. I had initally planned to use a striped jersey but I’d forgotten I’d used it for something else! (Don’t you just hate it when that happens?). 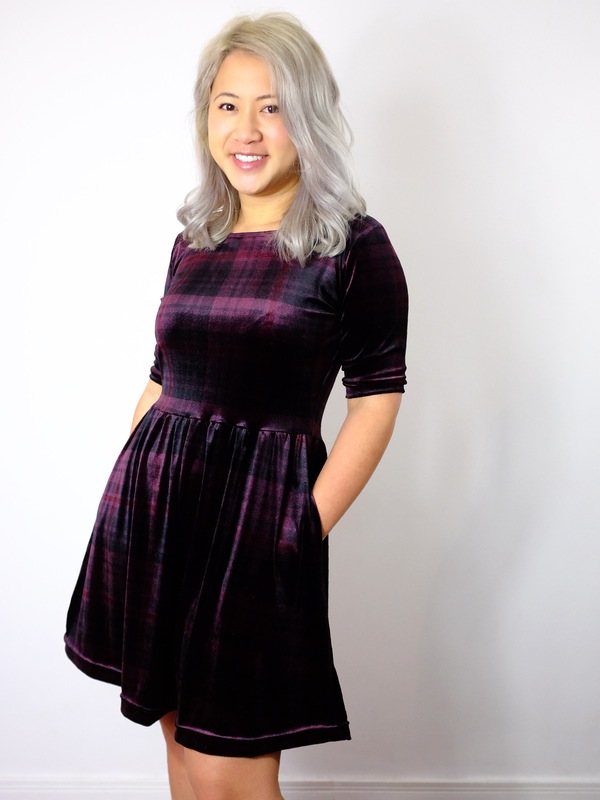 I ended up using a piece of maroon stretch velvet which had a subtle plaid print which was originally earmarked for some sort of velvet slip dress. I wasn’t sure if I had enough – I only had 2 yards and the patterns calls for 2 5/8. But it all worked out in the end. I even had some leftover! Despite not being sure I had enough fabric, I chose to make version C – the 3/4 length sleeves. Though in my opinion I think they’re a bit short to be truly 3/4 length. I cut a medium. I didn’t want it to be particularly fitted and my measurements were coming up on the large end of the small. I didn’t want to risk it being too tight! 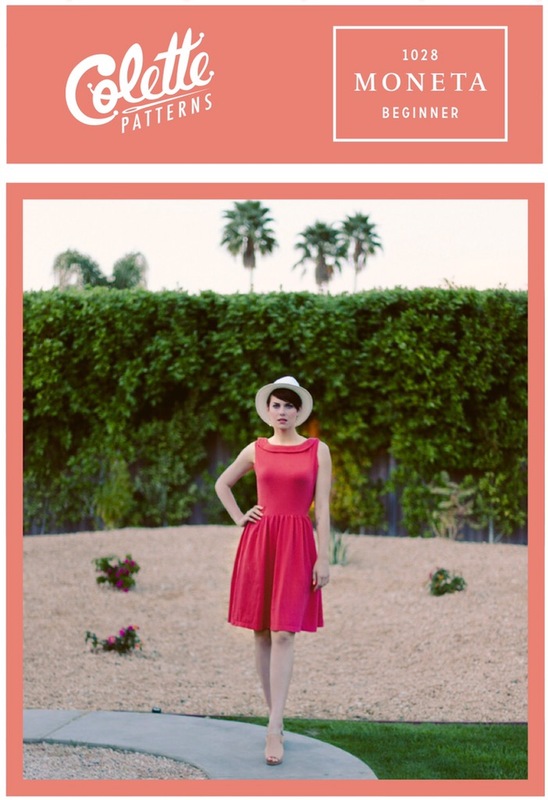 Alterations-wise, I loped 3″ off the hem length. In retrospect I should have taken a little out of the bodice length too but I think it’s just about workable as it is. I probably won’t bother changing this one but any future Monetas would probably get that treatment. I opted to make a neck binding rather than follow the instruction to turn and hem. I just think it looks better! I also missed out the ‘shirring’ technique they used for the skirt. I didn’t have any clear elastic (and didn’t have time to buy any) for starters. Or the belief that that was the best method to use… I ended up sewing 2 rows of basting stitches to the skirt and pulled to gather them by hand. From there I attached it to the bodice with a zigzag stitch on the machine and finished it with an overlocker. Worked perfectly well for me! So what do you think? It’s a bit of a winter dress I think so I’m not sure I will get much use out of it at the moment. It looks best with boots! A cameo on the Tilly and the Buttons blog! A super glam wedding outfit! Looks great! Love the colour. I would say it is more of a Christmas drinks party dress. 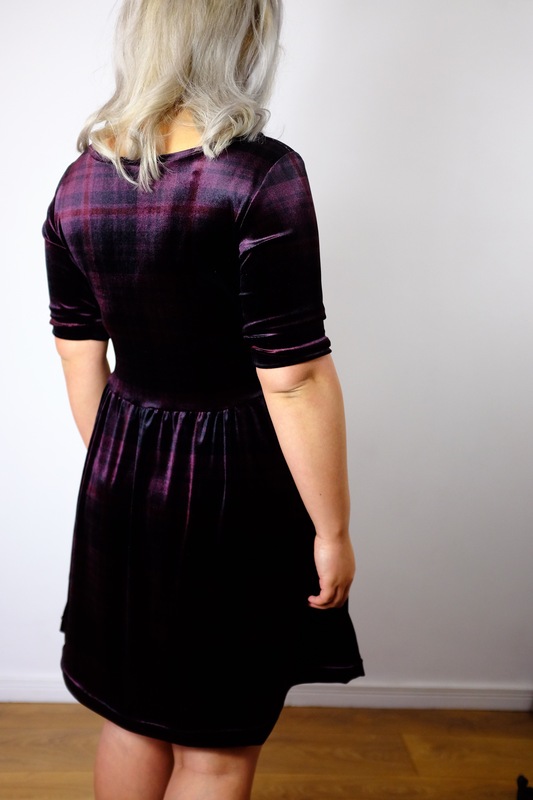 I am forever making garments in the wrong season! Never mind! Haha! I am too! It’s definitely a winter/ Christmas dress. I’m hoping to get a little bit of use out of it before putting back into my wardrobe for next winter! Love the fabric on this one! It really complements your hair as well! Thank you! 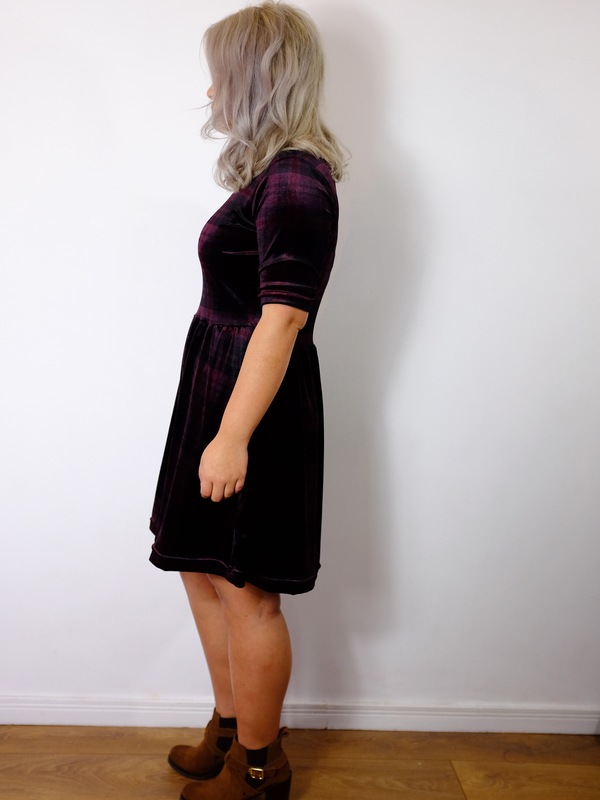 I think my current hair colour definitely goes with more stuff! Lol. It’s lovely fabric, quite unusual. I like how you’ve bound the neckline. Well I absolutely love it on you, it really suits you and I love the colour. Another beautiful dress! I truly love your fabric selection, it’s really beautiful I’ve never seen anything quite like that! It looks great. The sleeve length is just perfect as well. Gosh! Lovely make and fabric choice! This dress is really great, fabric is really good choice, intreaged by shiirring elastic at the waist , does it just pull over the head ? It does just pull on over the head but I didn’t use the shirring elastic mine. I ended up just gathering the waist and attaching it to the bodice with a zigzag. It seemed a little unnecessary to me 😕.